This weeks Tasty Theme: Plantains!!! Named as one of the safe starches by the Paleo community, plantains are gaining popularity quickly. I’ve been cooking with them for a few years now and I love their versatility. One of the things I love the most about plantains is the way the flavor changes from starchy and potato-like when green, to sweet and banana-like when over ripe (black peel). Plantains make great snacks, are perfect in savory dishes, and have a permanent place in my dessert repertoire. Let’s learn a little more about this delicious food. What’s the difference between a plantain and a banana? A plantain is a member of the banana family. Plantains are generally longer with angular ridges and thick peels. While bananas can be eaten raw at any stage of ripeness, you will probably not enjoy a raw plantain unless it is over ripe (a black peel). Plantains have a much higher starch content then bananas and are lower in sugar. Therefore, biting into one when it’s just ripe (green peel), will be like biting into a raw potato. Plantains sweeten up as they progress through the stages of ripening, so be aware of this when purchasing them. You will want to match the level of ripeness to the amount of sweetness you are looking for in your dish. Plantains are grown in the Caribbean, Central and South America, and can be found in India and Africa. I love eating local as much as possible, but there are items I make exceptions for and plantains are one of them. Green plantains are starchy and taste little like a white potato. They have a firmer bite at this stage and hold their shape. Yellow plantains are a little sweeter. They may have a little more of a banana flavor, but still retain some of that starchiness of the green plantain. I have found that yellow plantains are a bit of a mystery. You don’t really know how sweet they will be until you start noshing. Plantains that are over ripe (have dark spotted skins or are fully blackened) will be the sweetest and will taste very similar to a banana, although it isn’t exactly the same. Over ripe plantains will be a little mushy (great for mashes or purees). How the heck do you peel these things!? Bananas make great snacks on the go. They conveniently come with their own little wrappers and can be easily peeled without any kitchen equipment. Plantains, not so much. These puppies can be a bit of a bear to peel, but one you get the hang of it, you will find it’s not such a big deal (plus, the reward is totally worth the effort). I like this tutorial. So now that we know all about plantains, let’s get to some recipes!! 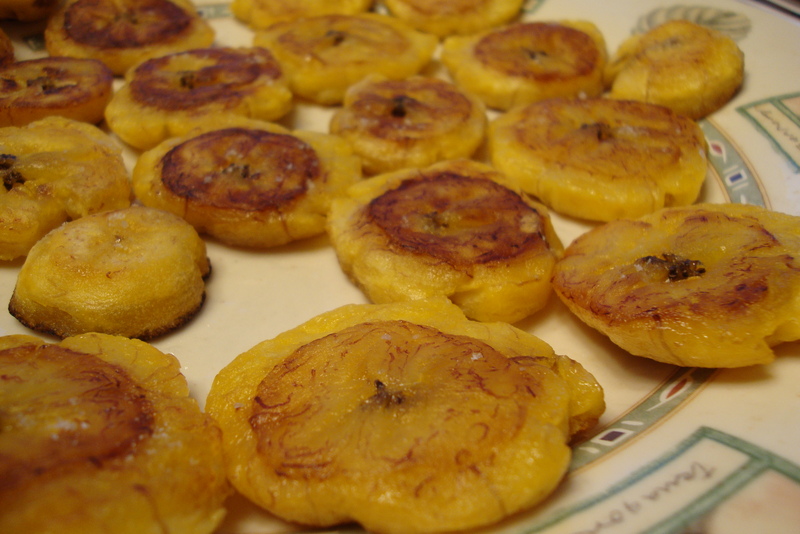 Tostones (Fried Plantains) – My first try at cooking with plantains. This recipe works well at any stage of ripeness and can be served as a side dish, dessert, or a snack. Pastelón (Puerto Rican Lasagna) – A great way to try plantains in a savory application. Layers of plantains surrounding a delicious ground beef layer? Yes, please!! Green or yellow plantains work well here. Jibarito Sandwich from The Primal Recipe Archive – Here, my sister uses plantains in place of sandwich bread. This looks so good! Tigrillo (Ecuadorian Plantain, Cheese & and Egg Scramble) from My Little Jar of Spices – This recipe treats green plantains like potatoes by boiling them first and then mashing before scrambling with eggs and cheese. Jamaican Beef Patty from Jamaican It Paleo – MUST. MAKE. SOON. Here, plantains are used to make the crust surrounding an amazing looking ground beef mixture! Plantian Tortillas form Zenbelly – Brilliant. Absolutely Brilliant. If you have been looking for grain-free soft tortilla recipe, this is it. I made these a few weeks ago and they came out perfectly. Alex and I could have easily eaten the whole batch! Tex-Mex Plantain Taco Bowls from The Primitive Homemaker – If hard shells are more your thing, check out these beautiful plantain taco bowls! They are almost too pretty to eat. Guess what else? It’s AIP compliant – yay! Tyler also has directions for making these into regular taco shells. Plantain, Avocado & Friends Paleo Breakfast Bake from The Healthy Foodie – Plantains for breakfast? Sure! It has avocado in it? Even better!! Creamy, Dreamy Tropical Chicken Curry from The Healthy Foodie – A great use of sweet plantains in a savory dish. Green Plantian Pancakes from The Curious Coconut – A savory pancake using green plantains with the added benefit of gelatin. Easy Shredded Pork Over Caramelized Plantains from PaleOMG – This dish is awesome. I’ve made it several times and it rocks. Honey Mustard Crunchy Chicken Plantain Salad from PaleOMG – Another awesome plantain dish from PaleOMG. I love making this salad for a quick lunch and the leftovers are delicious cold or warmed! Paleo Plantain Chips and Easy Guacamole from Gutsy by Nature – No need to buy plantain chips from Trader Joe’s. Make your own! Looks like a great snack option! Grain-free Plantain Bread from Purely Twins – Looks like an excellent replacement for pitas or flatbreads. I bet this would be awesome for dips or spreads at a party! Garlic Rosemary Plantain Crackers from Autoimmune Paleo – Yum, yum, yum!!! Sweet Plantain Guacamole by The Civilized Caveman from Paleo for Women – I never would have thought of using plantains in guacamole, but I bet it tastes amazing. This is a must try!! Autoimmune Protocol Plantain Pizza from Simple and Merry – Great idea for a grain-free pizza crust. Plantain Flour Pancakes from Chris Kresser – If you can get your hands on some plantain flour, this looks like a great pancake recipe! Caribbean Shrimp with Plantains and Mango Salsa from I Breathe…I’m Hungry… – Seriously?! I was sold at shrimp and plantains and then she went and threw in some mangoes! Mofongo: Puerto Rican Style Plantains from Beauty and the Foodie – A savory dish with a hearty dose of BACON! Flourless Fudge Brownie Bites from Hold the Grain – Let’s end this on a sweet note. These brownie bites are made with a medium ripe plantain (yellow with black spots) and the frosting uses an avocado! Gluten-free, Grain-free, Paleo, Plantains. Bookmark. Thanks for including my paleo plantain chips and guacamole! It is a super-popular post on my blog! I’m making these tonight to go with our burgers! Thanks for posting these ideas! Looking forward to trying several of them! You’re welcome! Glad you enjoyed the post. I’m working my way through these recipes and haven’t been disappointed yet!! Ooo! That sounds so good! I love all of those things and I bet they taste great together. Thanks for checking out the post and for the yummy suggestion!